One bill would remove many regulations, including a ban on partial-birth abortion; other bill would repeal the state parental-notification law. 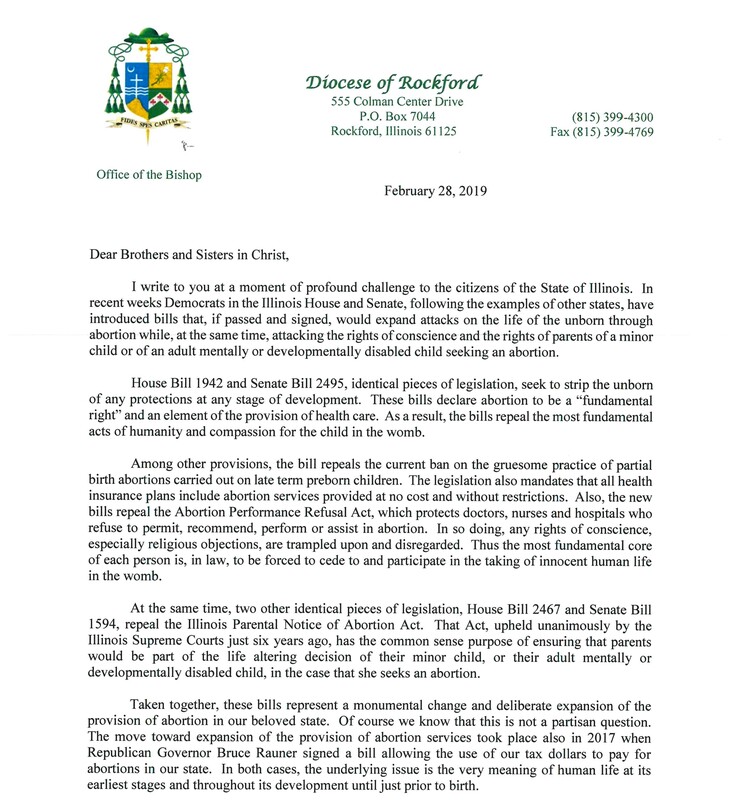 CHICAGO — Cardinal Blase Cupich of Chicago has spoken out against a pair of Illinois abortion bills, calling them a radical and disturbing movement away from the common good. 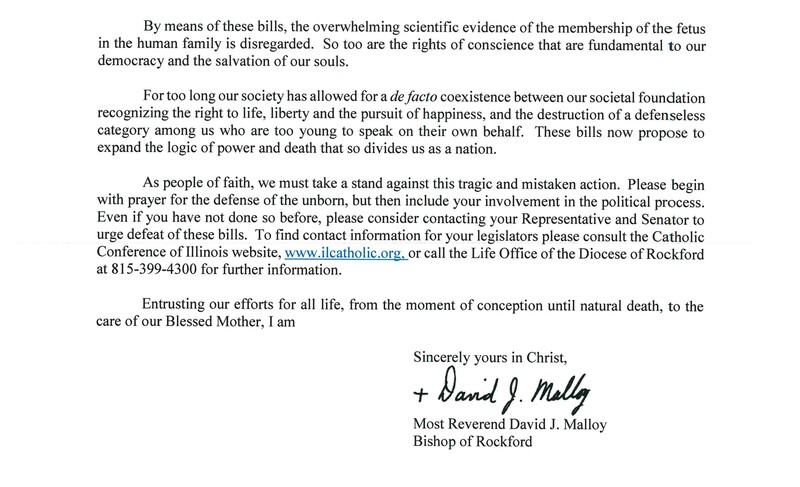 In a March 23 letter to the people of his archdiocese, Cupich encouraged Catholics to take a stand against the legislation. Categories: Announcements, community, Dios, Fe, From the Bishops and the Pope, News | Tags: Babies, children, death, Illinois, law, life | Permalink. Categories: Announcements, Bishop Malloy, Calendar of Events, community, Fe, From the Bishops and the Pope, News, Pro-Life | Tags: Bishop Malloy, Catholicism, death, Illinois, law, life, Pro-Life | Permalink. We live in a time in which it is no secret that faith is being challenged by the ideology of secularism. Public, especially governmental, support for religion and faith has diminished. In fact, a case can be made that there is even opposition to faith that is growing in circles of our government and our public discourse. This anti-religious sentiment presents a particular and, in some ways, purifying challenge to every believer. In the past, the practice of religion was taken for granted; it was even fashionable. Everyone did it. Categories: Bishop Malloy, Catholic Church, Catholic Life, community, Fe, Knights of Columbus, ministries, News, Reflections | Tags: Catholic Women, Catholicicsm, closed mindedness to faith, faith, freedom, goodness, Government, Knights of Columbus, law, loiberty, Religious Freedom, state, supression, tyranny | Permalink. This month, in the popular Delaware coastal city of Rehoboth Beach, a crusading Catholic pastor has brought the Magi’s question to the forefront of the latest Yuletide debate over the constitutionality of a Nativity scene on public property. Categories: bible, community, Fe, News | Tags: America, christ, Christmas, Constitution, Jesus, law, religion, supression, USA | Permalink. The U.S. Court of Appeals for the 11th Circuit issued an order Thursday vacating a 2014 district-court decision against the Eternal Word Television Network in its lawsuit against the so-called contraceptive mandate issued by the Department of Health and Human Services. The order follows a settlement between the network and the Department of Justice reached Oct. 5. Under the terms of the settlement, EWTN will not be required to provide contraception, sterilization or abortifacients through its employee health-care plan. Categories: Announcements, Catholic Church, Catholic Life, community, Fe, News | Tags: Abortion, anti-health, Catholicism, christianity, contraception, death, Eternal Word Television Network, EWTN, faith, govenment, health, HHS, HHS Mandate, hope, insurance, Jesus, law, life, persecution, Pro-Life, Religious Freedom, Religious Liberty, supression | Permalink. Categories: Fe, News, News from Around the World, Pro-Life | Tags: children, control, evil, families, Government, law, Peru, Pro-Life, rights, state, sterilization, supression, UN, US, witness accounts, women | Permalink. The movie “Gosnell” challenges us to rethink the idea of “Pro-choice”. Have I seen the movie yet? No, but I know the story. You may remember some of the news covering the most prolific abortionist of the last twenty years, Kermit Gosnell. It was mostly covered by Pro-life advocates and totally ignored by mainstream media. Gosnell is now in jail for many crimes. The movie tells the shocking story of an abortionist who killed babies outside the womb and was responsible for the deaths of many women under his care due to the abortions he provided. The movie is rated PG13. It will be showing at 7:10pm this Thursday, October 18 in the AMC Showplace Rockford 16. I, Father Barr, plan on attending this movie and welcome all parishioners to join me. If you cannot make this time, I encourage you to watch this movie set on the trail of Dr Gosnell. Weather you are pro-life or pro-choice, it will challenge you of the depth of this huge social sin. It has been so engrained into our sense of identity, like that of slavery, that we must look at the consequences of our culture and to make a willed decision to change and get rid of any such atrocities in our time and in times to come. Categories: Announcements, Catholic Life, community, events, Fe, From the Pastor, News, Pro-Life | Tags: Abortion, abortionists, America, Babies, death, entertainment, Gosnell, House of Horrors, killing, law, mass murder, movies, murder | Permalink.